My confession: I hate peas in a soup! Hate ’em! 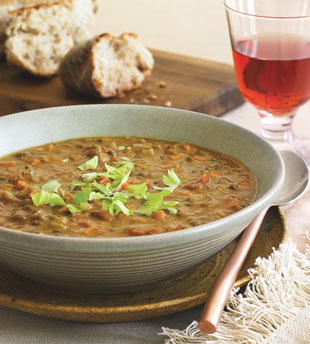 But, oddly enough, I absolutely love lentils in a soup! Love ’em! The whys and hows are a very long story indeed. But, suffice it to say that when I think hearty and I think vegetable soup, I inevitably think lentils. Gotta have ’em! To the ancient Greeks, ambrosia was the food or drink of the gods, something that had a lovely scent or flavor an which, when ingested, conveyed immortality. Lentils, with 26% protein, loads of B vitamins, folate and two essential amino acids, will certainly power you up and, when combined with other vegetables, give you the necessary building blocks for a longer and healthier life. The additional herbs and spices in this soup give a most heavenly scent that will tantalize your nose with delight. 1. Chop all veggies and measure out all spices. 2. Mix the nutritional yeast into the cup of warm water until dissolved. 3. Bring that water, the bay leaf and 4 cups of vegetable broth to a low boil. 4. Add the potatoes, cover and simmer for 7 minutes. 5. Add the lentils and reduce heat. 7. Add all spices and the remainder of the vegetables, except the zucchini. 8. Simmer for 20 minutes on low. Stirring occasionally. 9. Add zucchini, checking to see if more liquid (e.g. water or vegetable broth) is needed. Add as needed. 10. Simmer 10 minutes or until you deem it done. 11. Re-season to taste and serve. This looks really good!!! We’re eating so many lentil based meals lately. I swear I’m going to turn in to one. Your ambrosia soup really looks deep and flavourful. I am with you on peas in soup, but lentils, pulses and beans. I adore them. This soup really appeals to me. I’m glad I’m not the only one who looks at soup can ingredients to see if they can be done at home! This is great. We found the Amy’s version at Costco on a vacation and my son is addicted to the stuff. They don’t have it at our local store and I don’t really want to buy it anyway. I figure I can make this version and freeze it in 2-cup portions for his lunches. Thanks! Sounds really good! Just thought I’d pass on a tip I picked up from a Greek restauranteur, while living in Montreal. Just a splash of vinegar or lemon juice to a lentil soup when it’s finished adds that “je ne sais quoi”…gives everything a magical lift. Yum. Try it. Hope you like it! Made this tonight, it is delicious. I highly recommend 1 tbsp of white vinegar to balance the flavor. I was very happy to see your recipe for Amy’s Lentil soup. I use a lot of Amy’s products, but am trying to cut down because of cost. Are you working on developing new recipes from the Amy’s line? I would so love it and so would my purse.